The Euro traded as high as 1.1380 yesterday before the positive momentum began fading, despite better than expected European data such as the Sentix Investor Confidence improving in March to -2.2 from the previous -3.7, in addition to the PPI increasing in Feb by 0.4% MoM and by 3.0% YoY and beating forecasts. On the other hand, the US dollar strengthened driven by the progress over US-China trade talks, despite disappointing Construction Spending data. Today, the macroeconomic calendar is quite busy and will likely be the main market driver. It includes the Services and Composite PMI from both the EU and the US, European Retail Sales for February, and later in the day from the US: Building Permits, New Home Sales and the Markit PMI. The Euro broke below 1.1365 (R1), previous support area, after days of just bouncing off from that level. 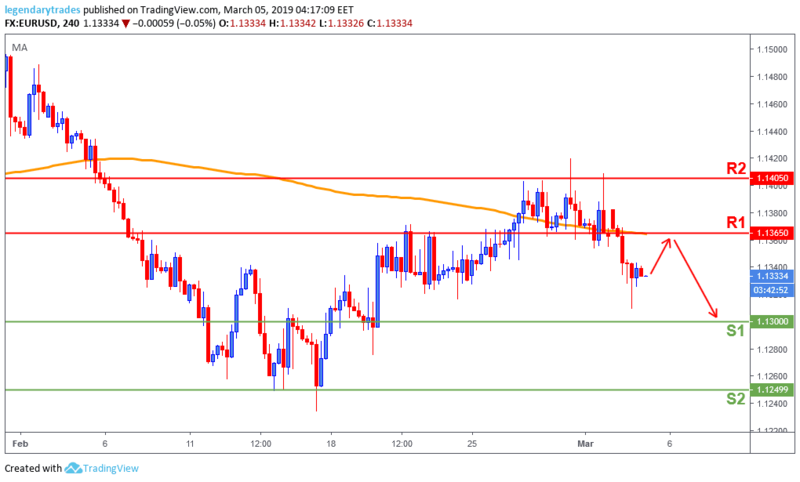 Price should find resistance today if we see a retest of 1.1365 (R1), as the bears will likely try to test 1.13 (S1). A break below it, the Single Currency could further weaken towards 1.1250 (S2).